I am so sad that I didn’t get to see The Blum Collection exhibit when it was in the U.S. This collection of over four THOUSAND Swatches has tons of prototypes that just make me drool. Here is a playlist of videos of the collection. This collection has prototypes for Swatches that are nearly impossible to find in their final form. They have seven iterations of Eclipses in a wide variety of colors that just make me green with envy. I told myself that I was going to take a month off and not write a word for a month, but my fingers have all of these muscles from writing every day and they get restless if I leave them with nothing to do. I wrote over 14,000 words in two days. I can’t expect to go cold turkey, can I? After years of writing almost every day, doing 2000 words a day isn’t that difficult. I am working on my new novel/blog: Merriton – 35 Minutes from Home. I already had several chapters written before I started and an outline for each week for the next two years, but I’m not counting all that in my word count for NaNoWriMo. I’m just working on adding 2000 new words to the total every day this month (except the four days for Thanksgiving weekend). My only hope is that I don’t procrastinate and leave myself with 14,000 words to write in the last two days like I did in 2004. They wouldn’t let me just show you the video here, so you’ll have to go to YouTube to see it. I can’t believe how funny these commercials are. They totally make me want to buy a Toyota Yaris, because, you know, it’s a car! Ironically, my VW Beetle didn’t have this feature. The windows broke so often that I eventually just stopped rolling them down at all. My Beetle wasn’t very good in this department either. It had two cup holders that couldn’t hold anything larger than a can of soda and even that was a tight squeeze. Nine airbags! I AM PROTECTED! I think you have to have a good buzz on to fully enjoy this one. I haven’t enjoyed commercials for a LONG time. Thanks, Toyota, for helping me enjoy advertising again! This postcard from PostSecret made me want to hug the girl who sent it. 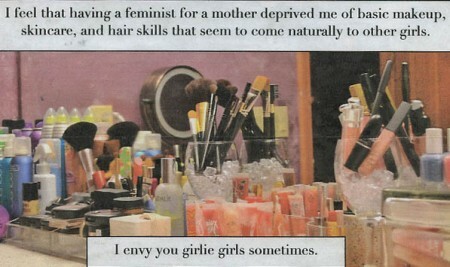 I feel that having a feminist for a mother deprived me of basic makeup, skincare and hair skills that seem to come naturally to other girls. I envy you girlie girls sometimes. My mom never really taught me how to do makeup or style my hair. I think she did it because she wanted me to stay a kid as long as I could. Pathetically, I stayed a kid until about ninth grade when I realized that I needed to get some makeup and hair skills or I was going to be ignored my whole life. Heat Free Dolly Curls from YaYaLifestyle: This has been my absolute FAVORITE hairstyle lately. So easy and it looks really good the next morning. The only thing I do differently is that I apply TONS of anti frizz (I used BioSilk) to my hair because my hair is a frizz magnet. I love the tutorials from Sephora’s YouTube Channel because they sell makeup sets and then SHOW you how to use them. If you want to go with your own makeup, they also have great general tutorials. I love this five minute makeup tutorial. They focus on making it quick and easy. Of course, I need to focus on blemish coverage (still have pimples, even at 42 years old!) instead of worrying about baggy eyes. My eyes are fine and mostly hidden under my glasses, so I would spend more time on hiding all my pimples. Last year, I bought this palette and I loved this video because it showed me how to actually USE the makeup I bought. Honestly, all the skin care tutorials just talk about products and I have never found a skin care routine that has worked for me, so I have nothing to share there. Here’s a good tutorial for how to shampoo your hair, though. I don’t use the turbo turban. I find the towels at Ikea work the best. That girl who felt like she never was taught how to use makeup by her mother just breaks my heart because I felt the same way. Fortunately, there is an entire ARMY of people online willing to teach me how to be a girlie girl. Should I Move To Daybreak? we are contemplating a move to daybreak from harvard/yale area. can you provide me with your opinions both good and bad. our rationale: i am sick of the cost of maintaining a drafty old house. looking for something that feels the same without the expense (time and money). daybreak seems like a good choice, but i know nobody who lives there. plus it seems like a fun neighborhood for kids. oh, and how are the schools? Living in Daybreak is definitely different from Sugarhouse. If you work downtown, your commute will be horrible unless you are able to take Trax. That is the worst part of living here. 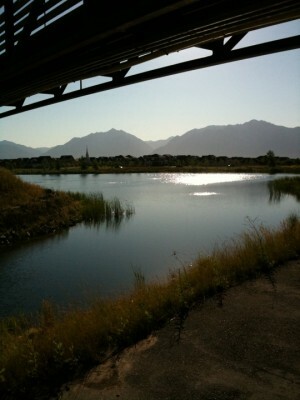 Sometimes, it takes me thirty minutes just to get from Daybreak to I-15. I thought the 114th South exit would help, but it’s still an ordeal just to get to the freeway. If you can take Trax, it’s awesome because you can read or listen to music, but driving it is miserable. I LOVE that our house needs no maintenance. We were constantly fixing things in the Lake Street house because it was over a hundred years old. It’s so nice to live in a house that just works. One caveat, building a new house is always a nightmare. It would be better to buy one of the existing homes here than to try to build a new one. This house takes less money to heat as well. Even though it’s twice the square feet, it’s so energy efficient that we pay less in heating and cooling. One unexpected plus is there is less smog out here. Since we moved here, Mike’s asthma has improved so much that the doctor has cut down his dosage of all his medications. That saved us money, but more importantly, my husband is much healthier. We will never move back to Sugarhouse for that reason alone. This is our third winter in Daybreak and I am not dreading it like I used to because I know that Mike isn’t going to be struggling for his every breath. I love the Daybreak activities. They do something every month and I really look forward to them. The summer is the best because they have live music every Friday and Saturday night. If you want the Sugarhouse feel where you can walk to and see the activities, try to get a place near Soda Row or the Community Center. East Lake and the North Shore don’t have as many activities within walking distance as Founders Park does. I don’t have any children, so I can’t tell you about the schools. It’s nice that there are so many kids here, though. I always found it a little creepy that there were never any children around in Sugarhouse. Pick Me! » Daybreak Dream a Nightmare? The one negative that I can say is that the children run positively WILD here. It’s not uncommon to see a three year old child wandering alone with no adult supervision, so drive SLOWLY. If you’re thinking of moving here, I say go for it. I absolutely adore it here, so I would definitely recommend it. I just finished writing my 50,000 words for National Novel Writing Month. I’ve been working on Merriton: 35 Minutes from Home. It’s a two year storyline, so I haven’t actually finished the book, but I wrote the words that I said I was going to write. 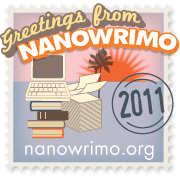 It was a lot easier than when I did NaNoWriMo in 2004, but it was still very hard.